In association with UWE and the Bristol Natural History Consortium, Stoke Park Estate is holding a Nature Outreach Day on Monday, May 25th from 1-5pm, featuring a day of family-friendly wildlife education and nature-based activities. 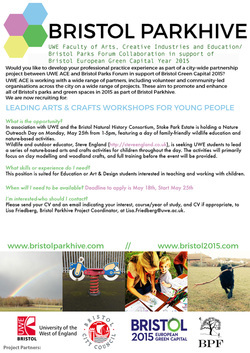 Wildlife and outdoor educator, Steve England (http://steveengland.co.uk), is seeking UWE students to lead a series of nature-based arts and crafts activities for children throughout the day. The activities will primarily focus on clay modelling and woodland crafts, and full training before the event will be provided. Suited for: Education or Art & Design students interested in teaching and working with children. 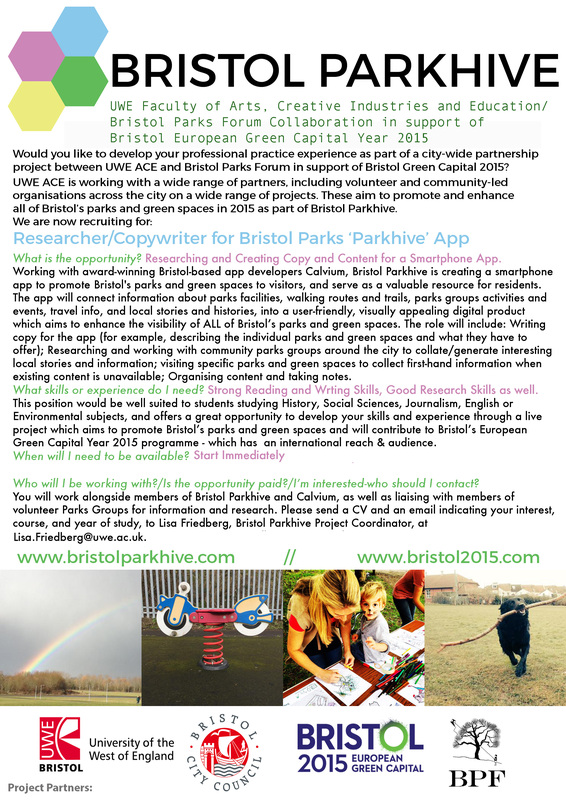 Please send an email indicating your interest, course/year of study, and CV if appropriate, to Lisa Friedberg, Bristol Parkhive Project Coordinator, at Lisa.Friedberg@uwe.ac.uk.